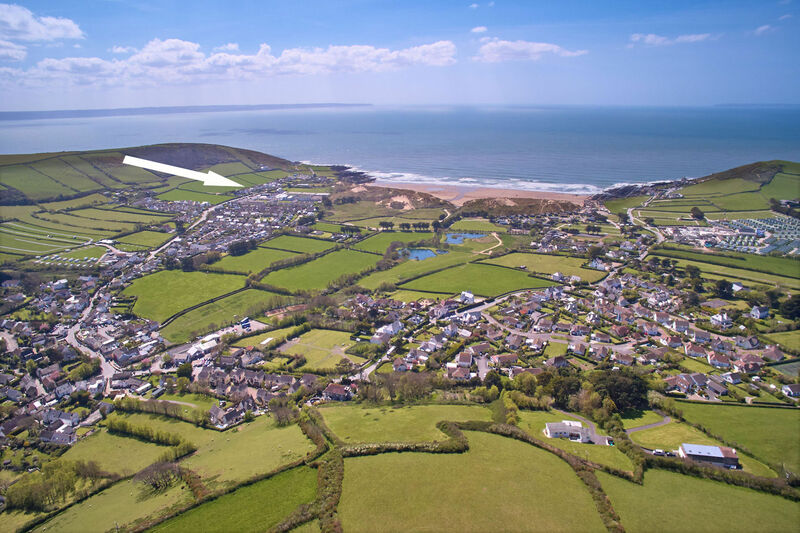 3 bedroom luxury apartment located within the exclusive Point View development, just a few minutes walk to Croyde's famous surfing beach. 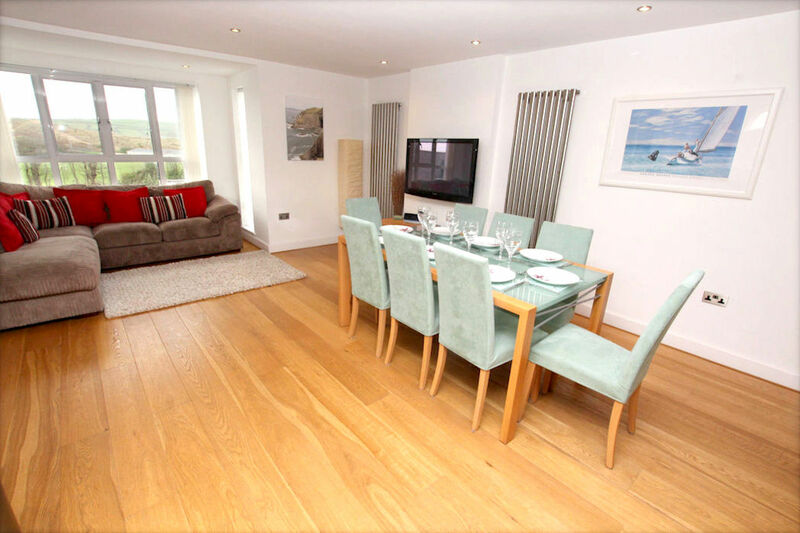 Open plan contemporary kitchen/living/dining room with large window overlooking the dunes and towards the sea. Master bedroom with juliette balcony enjoying 180 degree views of the Downend hillside, en-suite shower room, further twin bedroom and single room both with juliette balconies plus a family bathroom. 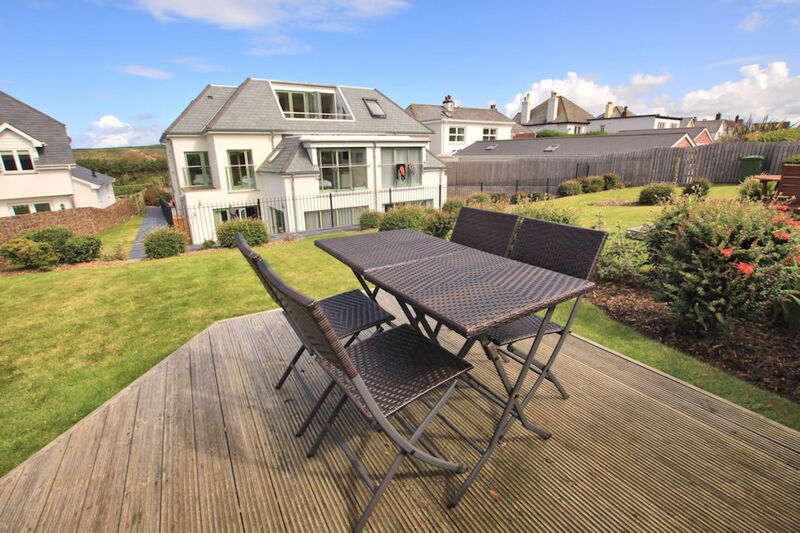 The open plan kitchen/living/dining room is furnished to a high standard and offers lovely views from the large bay window over the dunes and towards to the sea. 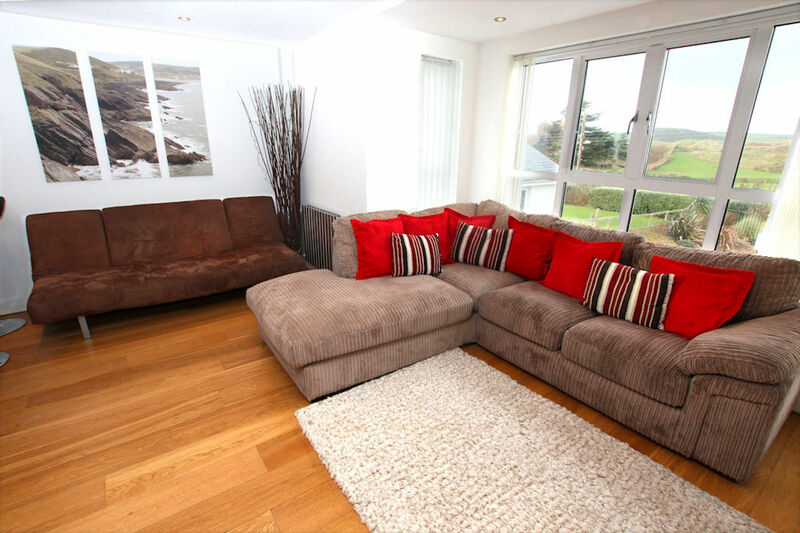 There is a corner sofa along with an additional sofa providing comfortable seating for 6 people. There is also a dining table with seating for 6. 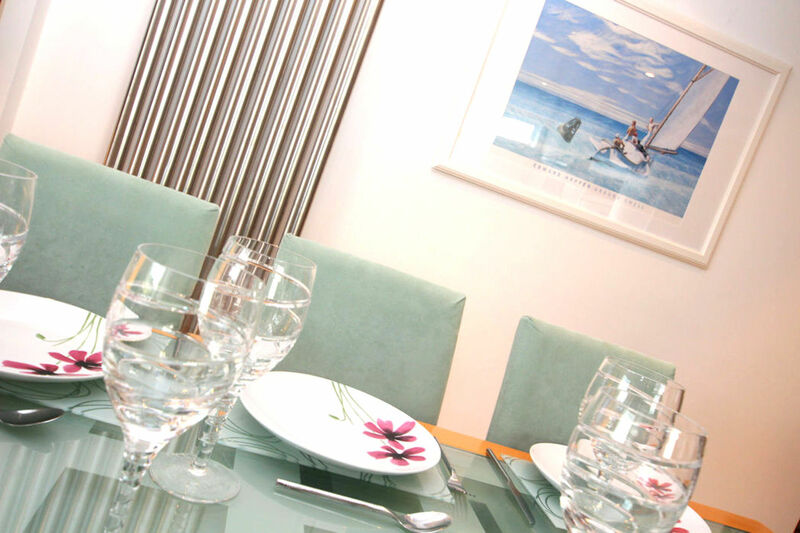 There is a wall mounted Panasonic flatscreen tv with freeview, iPod dock and wifi provided at the property. 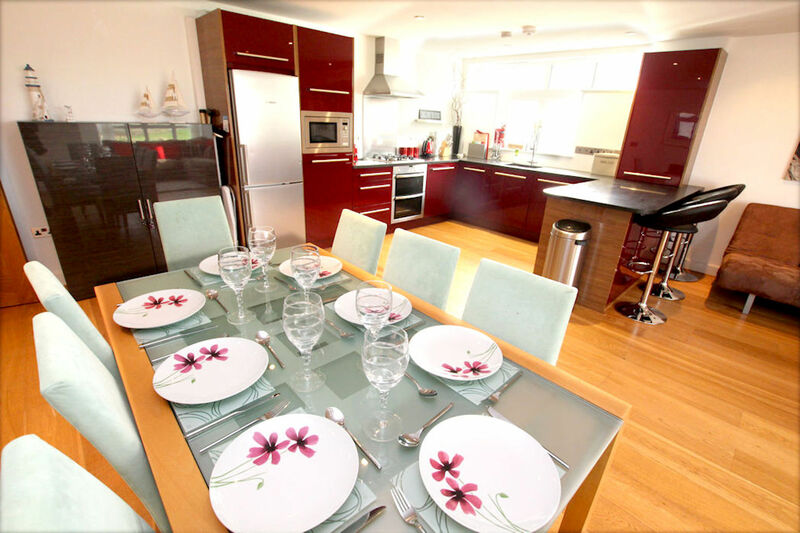 The contemporary, bespoke kitchen area has built in Neff appliances including double oven with 4 ring gas hob, microwave, washing machine, dishwasher and fridge/freezer. 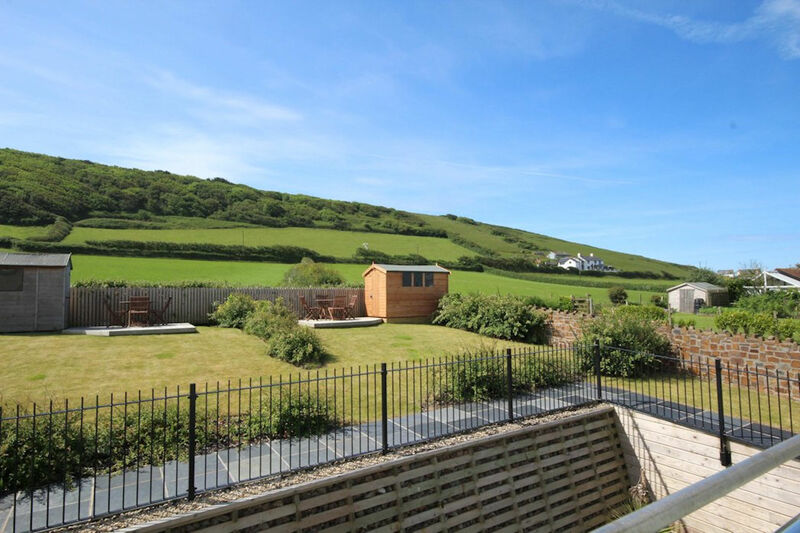 A fabulous view is enjoyed from the master bedroom with sliding doors onto the Juliette balcony enjoying beautiful views over the Downend hillside, this bedroom has a flatscreen TV with freeview along with an ensuite with shower cubicle, hand basin and WC. 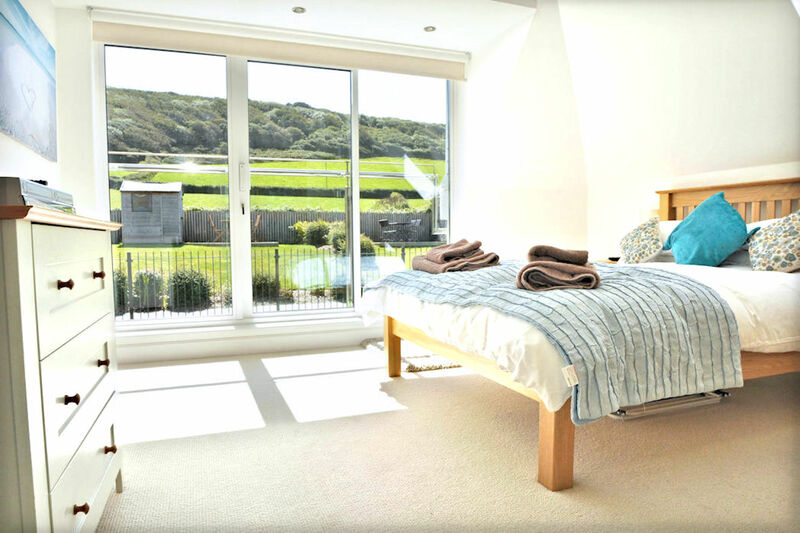 Both bedroom two and three benefit from the lovely hillside view. Bedroom two has two single beds with a Juliette balcony. Bedroom three has one single bed, and also features a Juliette balcony to the rear overlooking the hillside. There is a modern family bathroom completed with a contemporary finish with bath & over head shower. 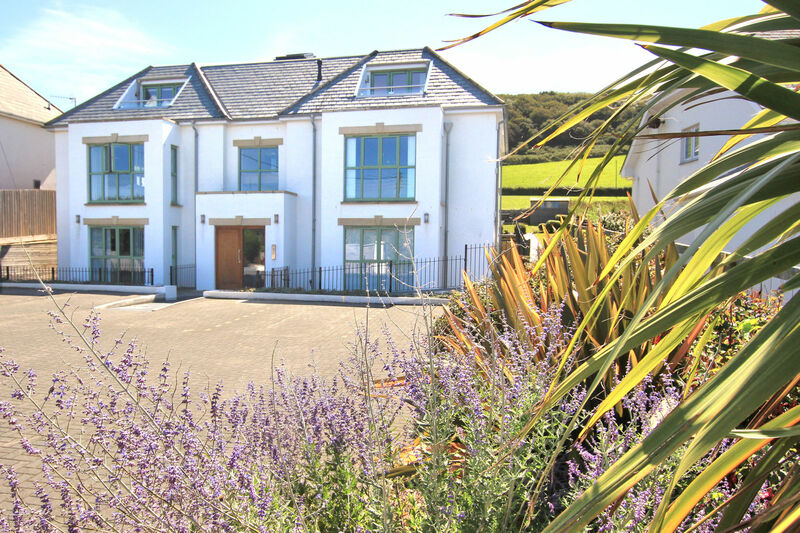 Outside the apartment there is a designated south facing lawned garden with decked terrace at the rear for entertaining, here views across Downend hillside and the sea can be enjoyed - the perfect place to sit and watch the sunset with a glass of wine! A shed is provided for storage in the garden. 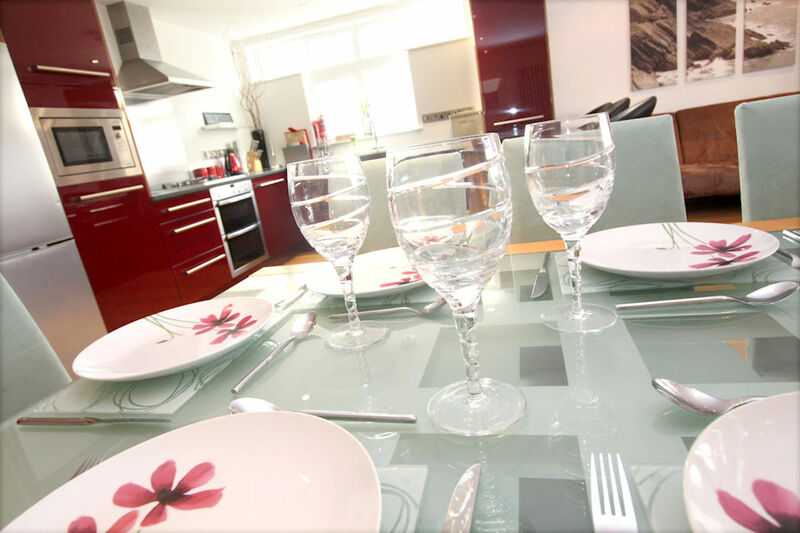 The apartment has secure gated parking for one vehicle plus visitors spaces. 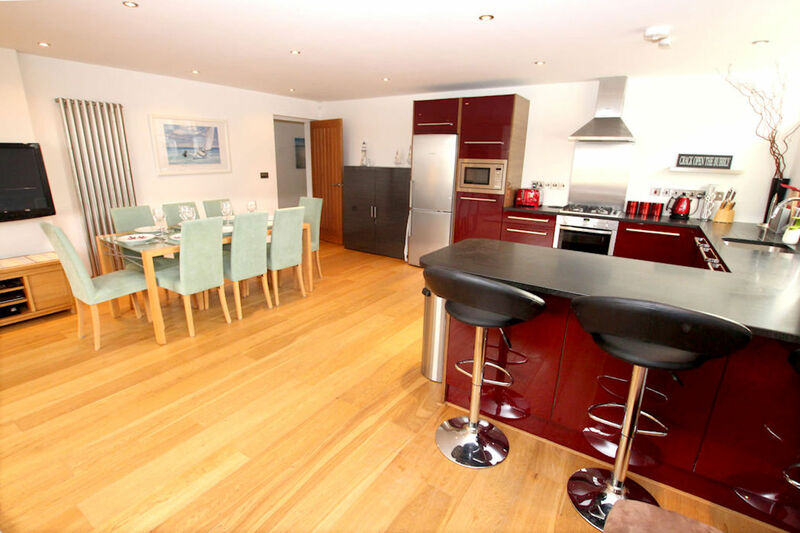 This apartment is on the first floor, with access via an internal flight of stairs. There are a few steps leading down to the main building. Looks just like the photos and very well equipped. 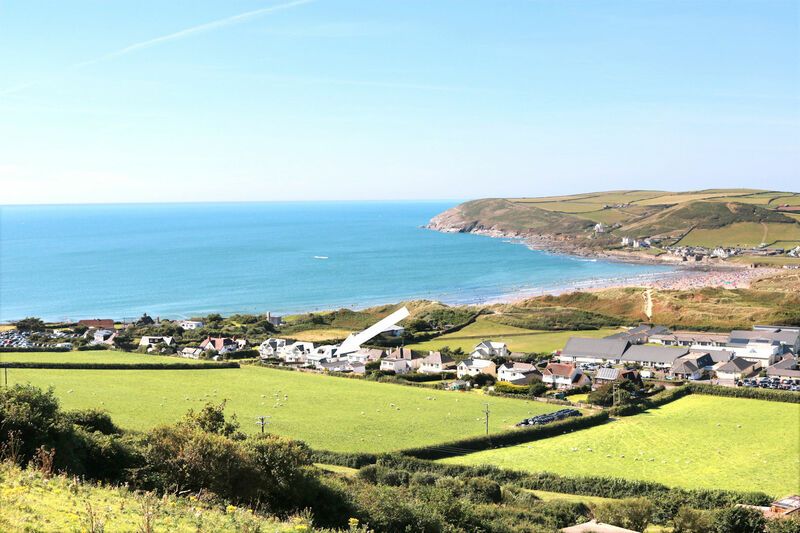 A great location for beach, village pubs/shops and coastal walks. 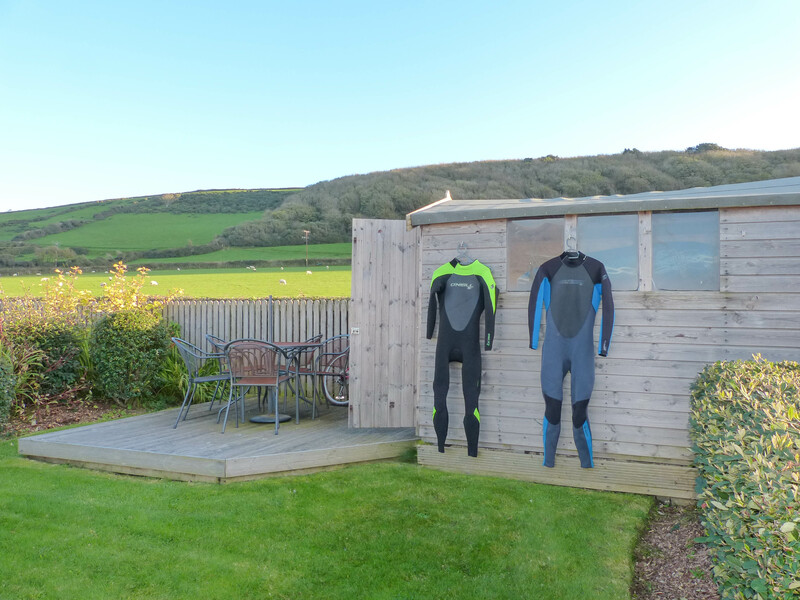 Access to the shed would have been great to dry and store wet suits but would definitely stay again. 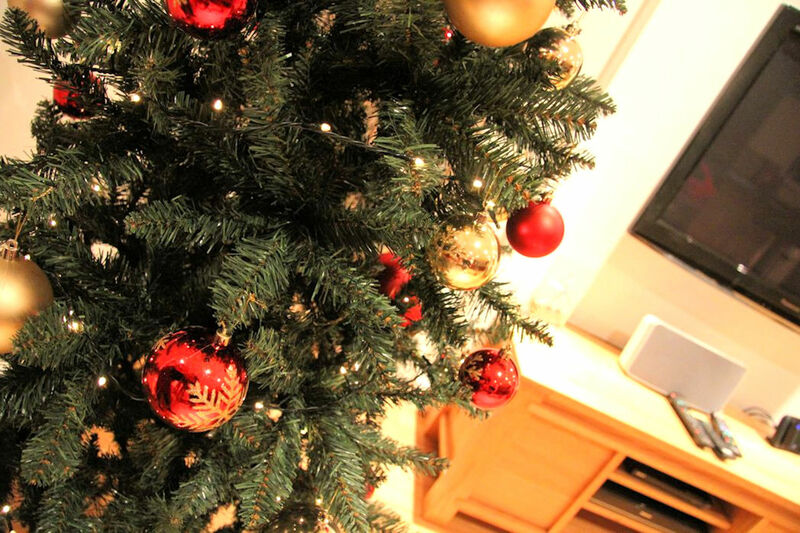 Beautiful Apartment, very clean and close to everything! I stayed at Point View for 5 days this week at the end of the season and everything was perfect! The local pub was still buzzing and all the people were lovely. The apartment was clean and had fantastic views. Our own garden also made a big difference as it was nice to sit out with the morning coffee watching the sun beat down! Everything we needed was supplied - kitchen fully stocked, towels and bedding etc. The beds were comfy also. Couldn’t recommend it more. Check-intime is from 4pm and the check-out time is 10am.